The Thanksgiving holiday is always a memorable time. Great food, great people…slightly annoying music. For one particular friend of mine, Thanksgiving is unforgettable for all the WRONG reasons. This friend has a holiday horror story that needs to be told so that nothing like it could EVER happen in the future. It’s a tale of heartbreak, betrayal, and frozen water. Grab some popcorn and a notepad, because it’s going to be a doozy. A large family requires A LOT of food on top of excellent preparation. But that fateful day a few years back, thanks to work and soccer schedules and the rest, my friend’s household lacked those key elements. Pushing that quickly to the back of their minds, it was time to prep the house for the big family gathering. Extra care had to be taken for Aunt Martha and Aunt Jenny—they have bad knees. The kids were tackling the last of the cleaning, and the husband was taking care of the wreath…but we’ll leave that for later. My friend is normally extremely prepared when it comes to hosting her family, but this year the soiree was truly sprung upon them. They had to rush to the store to pick up all the trimmings—pecan pie ingredients, cornbread, queso (my friend’s personal favorite)—and, of course, a turkey to be deliciously fried. Delegation is key to any successful event. My friend’s loving husband was tasked with getting the home ready, but detoured somewhere along the way and decided that the NFL pre-game was more important. My friend kept a calm composure as she returned from shopping only to find a few plates set out. Surely, just setting up a serving station will be just fine…right? After a few rushed cooking attempts and failures, guests began to arrive. They brought in with them a sprinkle of freezing rain—how lovely. My friend put on her best smile and went to greet her many family members. In between hugging her father and listening to “tsks!” from her mother about the lack of decorations (“That should have been put up BEFORE it reached basically freezing temperatures”), a loud YELP from the front doorway echoed in the foyer. They all rushed out the front door to see Aunt Martha on her bottom at the foot of the steps. The handrail had been loose for months and actually FELL OFF as Aunt Martha put her weight on it! Everyone was mortified, but thankfully Aunt Martha was fine—just in need of a glass of wine. It was 2:00 PM and already the first catastrophe down, soon after the next followed suit. Thanks partially to poor planning and partially the Cowboys distracting the adults, then they had ANOTHER incident. Another yelp was heard, this time it’s coming from one of the many nephews in the living room. Growing a little bored of waiting for food (70% of it had been burned and had to be remade), the younger kids decided to play a game of tag inside. And then my friend’s nephew ran straight into a large glass table with SHARP corners. The room just wasn’t set-up for the extra foot traffic…high-speed chase or not. My friend describes this moment in slow motion. “This CAN’T be happening,” she thought. But oh, it was. Frozen pipes, injured family and cold weather. What a treat. The table wasn’t affected, but the nephew’s head felt the wrath. Trying to comfort him, my friend ran to the kitchen to soak a rag in some cool water. The funny part was, the faucet was turned on, but no water was coming out. With a heavy heart, the family gathering was disbanded and Chinese food was ordered for those still wishing to stay. 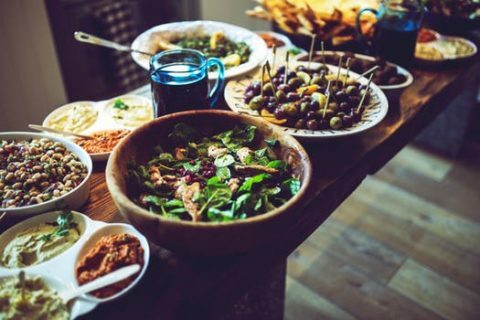 The holiday was not totally ruined and did make for hilarious stories at future gatherings, but what was most frustrating was that all these things could have been avoided. Winter creeps up on you quickly and quietly, and it’s important to be prepared and always on the defense. 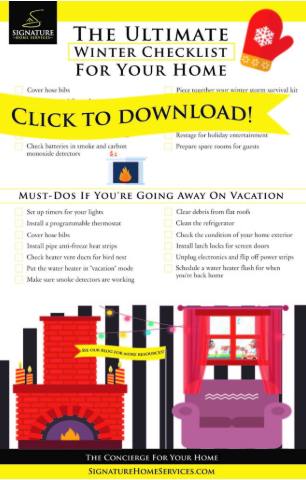 Making sure to have a holiday checklist is CRUCIAL to make sure your home, inside and out, is prepared for the season. So, next time you—or your “friend”—needs a little help, try Signature Home Service’s winter checklist! Any questions? Drop us a message or give us a call, my friend is more than happy to share their story and help you avoid all of their mistakes. Oh yikes Robin! 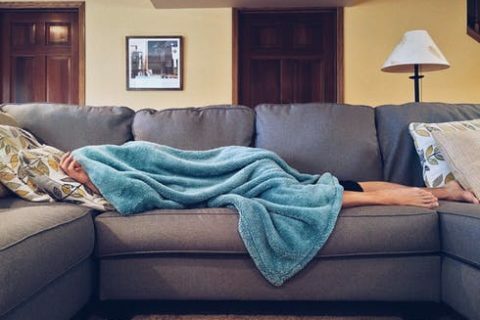 Your friend really had a bad day that day… thanks for sharing her story so we can all make sure to plan ahead as much as possible — especially for that possibility of frozen pipes when we have guests we’re entertaining for the holidays.